Join the discussion on our forums! 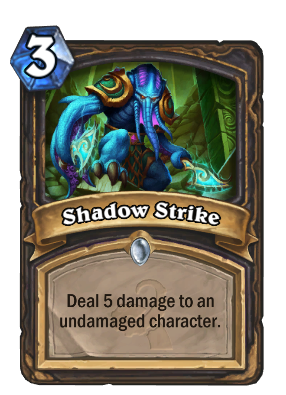 Come discuss Shadow Strike over in our dedicated Shadow Strike discussion topic. Deal 5 damage to an undamaged character. It's like a backstab, only from the front. And with two more stabs. Opponent has damaged my Druid with no full HP . BUG? I feel this was the removal tool the rogue needed. Kills so many important minions and is a great tempo play for only 3 mana. Some amazing targets for this are Emperor Thaurissan, Fire Elemental, Savannah Highmane, Faceless Summoner and Princess Huhuran. Can also deal with an early Thing from Below. I love the value here. Also nerfs Yogg-Saron, Hope's End as it can kill itself. Also nerfs Majordomo Executus and most importantly deal with sneaky Am'gam Ragers on a perfit curve. It looks like a protos from starcraft 2. This is more useful than it looks. It can, for example, remove things like Emperor Thaurissan as soon it comes to board (for 3 mana only). I wish they would have called this Ambush. A very nice, useful tempo card. You can combine it with SI:7 for 6 mana 7 damage. This can kill many turn 5 minions on curve, and it's ridiculously cheap. Wow. Finally, the on-curve answer to Am'gam Rager that we've all been waiting for.